The third annual Houston Fine Mineral Show will present an unforgettable array of natural, uncut, semi-precious mineral specimens like those displayed in museums throughout the world including the Houston Museum of Natural Science. Mineral dealers of unique and rare specimen crystals will display and sell fine minerals throughout the weekend. Established collectors, would-be collectors, jewelers, interior designers and anyone fascinated by the beauty of art created by Nature will be amazed by the stunning pieces on display and for sale at this show. Admission is free. For more information call 509-998-5987 or go to www.finemineralshow.com. Many minerals are common, but those of exceptional quality and beauty are rare as visitors will see at the Houston Fine Mineral Show. Fine mineral specimens have unique crystals of striking size, color, symmetric form and beauty. They have been preserved as Nature created them, often hundreds of millions of years ago. Formulated by a brew of chemicals in the Earth's subsurface, fine minerals continue to be highly valued and very collectible. While some collectors accumulate minerals for scientific purposes and others to acquire each attainable species, it is the beauty of nature and the artistic appeal that drive most people to seek additions to their collections. Dave Waisman, founder and producer of the Fine Mineral Show that is presented annually in Tucson, Houston and San Francisco, collects minerals because he is in awe of what Nature creates and the uniqueness of every specimen. Waisman explains, "That something so beautiful, complex and symmetrically shaped can be found in the Earth is a wonderful discovery. Nature has made all of these incredible natural sculptures. That's what makes mineral collecting so unique and beautiful." 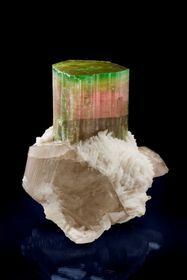 The Houston Fine Mineral Show (April 29 - May 1, 2011) will feature hundreds of rare natural gems like this remarkable tourmaline mineral specimen.